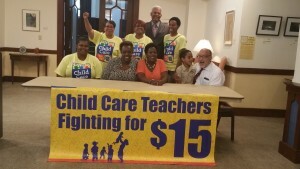 This week, child care workers, parents, and allies came together in Richmond, Raleigh, and Atlanta to call for affordable, quality child care and $15/hour and a union for workers. On Monday, August 3 in Richmond at the Memorial United Methodist Church, Rev. Rodney Hunter welcomed Congressman Bobby Scott and child care workers and parents to discuss the child care crisis. The next day in Raleigh, workers and parents shared their stories alongside Amber Moodie-Dyer from the NC Justice Center and state lawmakers Reps. Pricey Harrison and Yvonne Holley. On Wednesday, Congressman Hank Johnson spoke on a panel with child care workers and parents in Atlanta. View more photos from the events here and here. In case you missed it, see more news coverage in Forbes, The Miami Herald, The Nation, and Buzzfeed. 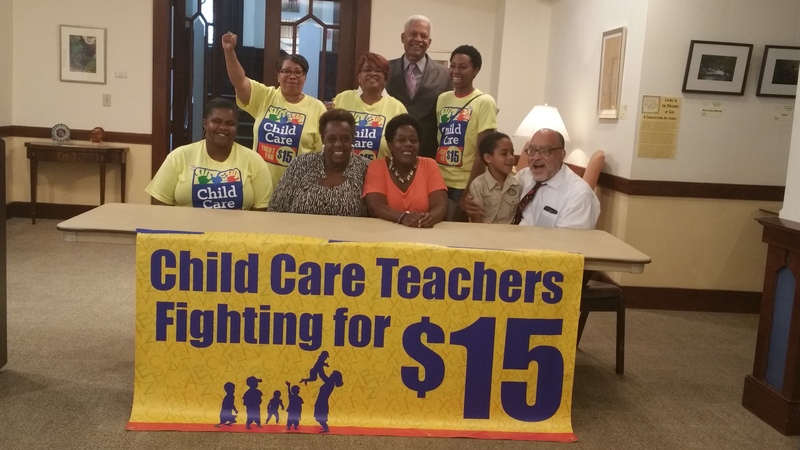 This entry was posted in Blog and tagged #childcareforall, #Fightfor15, Atlanta, CPC Tour, Raleigh, Richmond. Bookmark the permalink.